We have had this question on numerous occasions and thought we should comment. Most collectors like to look at as much art as possible and collect “their eye” (What they want to live with every day). Other collectors feel they need specific direction in their collecting. Some collectors have said “Russian” art is so big, it encompasses a multifaceted country with an artistic culture that has developed thousands of artists. Collectors of American art have had several generations to focus on groups like the “Ten,” the “Ashcan School,” “Pennsylvania Impressionists,” “California Impressionists,” “Hoosier School”, etc. 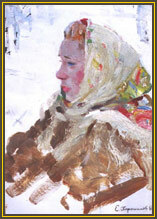 Vern Swanson wrote in his book “Soviet Impressionism” that there are a dozen or so great French Impressionists but there are several hundred top Soviet Impressionists. In the U.S. there are tens of thousands of painters, and depending on your point of view, perhaps a few hundred top painters. As more research is published on Russian and Soviet artists, it will be easier for collectors to get their arms around a specific collecting direction. When we have held museum shows, even historians who visited Russia in the 70’s and 80’s were surprised by the work that is now surfacing from the artists’ studios. During the Soviet period, all works that were submitted to open exhibition had to meet political requirements. The current Russian ambassador stated that he hopes the discovery of this art will provide a truer understanding of the Russian people. • Academy members – At any one time, there are 100 members of the Academy of Art. While there may be some politics to being appointed, these members are possibly the most influential artists in the country. •Academy studio heads and key professors. Several of these artists are also academy members and titled artists. •Titled artists – Titles are bestowed by various arts organizations. These include: Peoples Artist of Russia, Honored Artist of Russia, Personage of Art, and Honored Art Worker. Most of these titles can also be specific to a former state – Ukraine, etc. There are several hundred living and deceased titled artists. •Artists from St. Petersburg, artists from Moscow, artists from Voronezh, etc. •Artists whose works are in the State Russian Museum or the State Tretyakov Gallery. •Published artists – (With international art, it’s complicated because many of the top Russian artists are represented in books in a variety of languages. Linda and I have eaten Chinese just to obtain book translations). Sometimes trying to simplify something makes it even more complicated. We can make similar lists of options for American and British paintings both for impressionist and modern works. We’ve had 200 years to segregate the art vs 15 years for collectors of Russian art. Go with your heart: if you love two or three works and are only purchasing one, you can use the above criteria as a tie breaker.